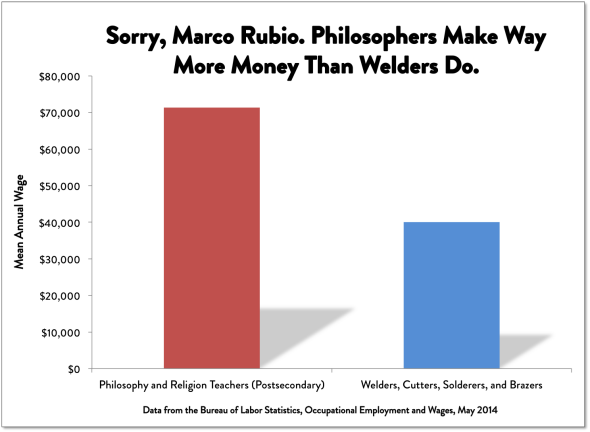 Marco Rubio says welders make more money than philosophers. He’s wrong. Marco Rubio Says Welders Make More Money Than Philosophers Do. He’s Wrong. If I thought raising the minimum wage was the best way to help people increase their pay I would be all for it, but it isn’t. In the 21st century, it’s a disaster. If you raise the minimum wage you’re going to make people more expensive than a machine. And that means all this automation that’s replacing jobs and people right now is only going to be accelerated. Here is the best way to raise wages: Make America the best place in the world to start a business or expand an existing business. Tax reform, and regulatory reform. Bring our debt under control. Fully use our energy resources so we can reinvigorate manufacturing. Repeal and replace Obamacare and make higher education faster and easier to access—especially vocational training. For the life of me I don’t know why we have stigmatized vocational education. Welders make more money than philosophers. We need more welders and less philosophers.